My efforts to get my blacklist available, both in ebooks and in print, continue. In this I am aided by Phoenix Pick, an imprint of the excellent small press Arc Manor. That's a good thing because I have proved remarkably inept at scanning, formatting, and mounting the backlist by myself. Phoenix Pick has just issued two mini-collections of my older stories. AI UNBOUND: TWO STORIES OF ARTIFICIAL INTELLIGENCE contains two novellas, "Computer Virus" and "Savior." In the first, an AI is trying to save its own "life" and is becoming increasingly desperate. The latter story covers four or five generations, during which a mysterious small spacecraft from the stars, completely impenetrable, lands in a corn field and just sits there while the USA changes drastically around it. What is it waiting for? THE BODY HUMAN: THREE STORIES OF FUTURE MEDICINE focuses on various facets of medicine. "The Mountain to Mohammed" takes on the growing gap between the insured and those with genetic problems that make them uninsurable (and I wrote it way, way before Obamacare!) "Evolution" addresses the growing resistance of bacteria to antibiotics. "Fault Lines" involves the development of new drugs by pharmaceutical companies -- and their unintended consequences. The stories in THE BODY HUMAN are near-future and grounded in real and alarming trends (although that doesn't mean these individual characters don't come out all right by the end). The AI stories are more fanciful. I haven't actually seen any small spacecraft in corn fields. Still.... you never know. 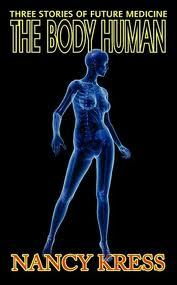 Looks like The Body Human is already available in electronic form (just got it on the Nook). Is there an ETA for AI Unbound in Barnes & Noble or other ePub store? 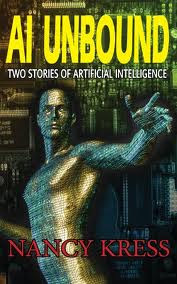 I thought that AI Unbound was available in ebook, too. I saw it on Amazon. I assume -- hope! -- that it will be out for Nook momentarily. You say in the title of your post your "backlist" but then in the beginning of the post, you wrote about your "blacklist." Are you blacklisting anything or is this a typo you may want to correct?